DownloadNp Blog: [How To] Combine Multiple Internet Connections with Connectify Dispatch ? [How To] Combine Multiple Internet Connections with Connectify Dispatch ? 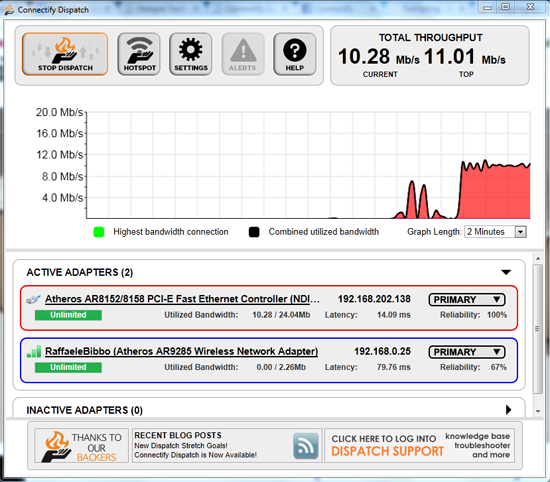 Connectify Dispatch is software for your Windows PC that lets you combine multiple Internet connections for faster speeds and increased reliability. In order to start combining your Internet connections, Dispatch first needs access to more than one Internet connection. Connectify Dispatch can utilize almost any combination of Internet connections. Combine Cable and DSL, or use home Ethernet with your 3G or 4G mobile hotspot device, such as your mobile hotspot, USB dongle or tethered cell phone. However, multiple paths to the same Internet source, such as connecting wirelessly and via Ethernet to the router that serves a single cable or DSL modem, typically will not help improve performance. Although Dispatch can recognize many variations of multiple Internet connections, for the purposes of this guide we will use one wired Ethernet connection, along with one 4G mobile hotspot connected via Wi-Fi. First, plug your Ethernet connection into the Ethernet port on your PC. 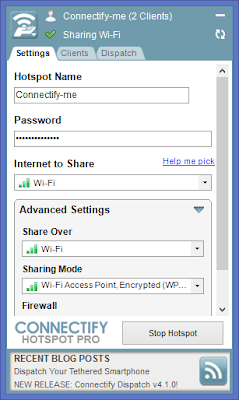 Then, simply connect your computer to the 4G mobile hotspot via Wi-Fi, as you normally would. To make sure that your PC is connected to both Internet connections simultaneously, simply visit Control Panel > Network and Internet > Network and Sharing Center where the ‘Active Connections’ should show both the Ethernet and 4G hotspot device as connected and their access type field should say Internet. Assuming you’ve already installed Connectify Dispatch, just click the Dispatch icon () in your Windows system tray or navigate to the ‘Dispatch’ tab in the Connectify application and click the ‘Show Dispatch’ button. Either action will open the Dispatch user interface. Once open, you will see that Connectify Dispatch has detected both of your computer’s Internet connections, but they will be listed under ‘Inactive Adapters’ until you enable Dispatch connection aggregation. Aggregation To tell Connectify Dispatch to start using multiple Internet connections to accelerate downloads and web browsing, just click the ‘Start Dispatch’ button located at the upper-left corner of the Dispatch interface. You’ll notice the ‘Start Dispatch’ button will light up orange when Connectify Dispatch is actively aggregating your connections, while your various Internet connections will now appear in the ‘Active Adapters’ dropdown.